I love Sunday's because we secular heathens don't have to go to church and so are free to explore the deserted streets at dawn like survivors in a zombie movie. This morning we went to Perkin's for breakfast. We've become quite popular at Perkin's because of the overbearing cuteness of Samantha. Whenever we get up to leave all the waitress's line up to say goodbye as Sam saunters through their gauntlet of love like she's the Queen of the Diner. After breakfast we met the Torres' at Chuck E. Cheese. Sunday morning at 9 a.m. is the absolute best time to go to Chuck E. Cheese because all the Baptists are in church condemning rock-and-roll and homosexuality, which leaves the home of the giant rat deserted. Samantha didn't really like the rides very much as none of them included food or The Wiggles, but we did get her to play some Skee-ball. Sam's idea of Skee-ball is to grab a ball when it rolls down the chute and run around the restaurant, probably in hopes of finding something small enough to kill and eat. For her, it's really about the ball, not so much the Skee. After playing for an hour we took Sam over to the prize counter to redeem our tickets. Unfortunately we only had 47 tickets which is a mere 1453 shy of what you need to get a smartie. 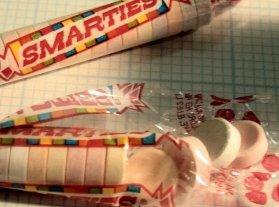 Not the whole package of smarties, just the one. So, we traded in our stubs for a handful of lint and counted ourselves lucky.